Having shown your ID or passport to the returning officer, you will be given one ballot paper of each Mayor Nominee and an envelope. If you live in the former municipality of Kranidi ( Kranidi, Porto Heli, Kilada, Didyma, Fourni, Rado) the first part is that of the electoral region of Kranidi. If you live in the former municipality of Ermioni (Ermioni, Thermisia, Iliokastro, Loukaiti) the first part is that of the electoral region of Ermioni. The second part is that of the electoral region of Ermioni if you live in the region of Kranidi, or of Kranidi if you live in the region of Ermioni. The third part is that of your local community. Put a cross next to the names of 1–3 different nominees of your preference at the first part of the electoral region. Put one cross next to the nominee of your preference at the second part of the electoral region. Put one or two crosses (please check the number on the ballot paper) next to the names of the nominee of your preference at the third part of your local community. Fold your ballot paper, put it in the envelope and seal it, then put it in the ballot-box. Don’t forget to collect your ID or passport at the returning officer’s desk. 2.DIMARAKI Anastasia (Nastasia) daughter of Evaghelos. 3.DIMITRAKOPOULOU Anastasia daughter of Panaghiotis. 4.KRITIKOS Andreas (Andrew) son of Lazaros. Professor of Mathematics, Tutor, Municipal Councilor of Ermioni period 2006-2010. 5.KRITSOTAKIS Ioannis (John) son of George. Teacher, Chairman of the Board of the Legal Entity of Public Law of the Athletic Center of Ermioni named « GEORGE AND EVANGHELIA BOURNAKI» 2003-2011, Municipal Councilor of the Municipality of Ermioni period 2007-2010, President of the Municipal Council of the Municipality of Ermioni period 2009-2010, President of the Municipal Community of Ermioni period 2011-2014. 6.IKONOMOU – SKOURTI Maria (Mary) daughter of Emmanuel. 7.PALOUKAS Anarghiros son of Efthimios. 8.STAYIA Marina daughter of Theodoros. 9.STAIKOS Panayiotis son of Evanghelos. 10.SCHINAS Dimitrios (Jim) son of Ioannis. 11.TZANI Stamatina daughter of Athanasios. 12.CHRISANTHOPOULOU Ekaterini (Catherine) daughter of Platon. 1.AGRIMIS Panayiotis son of Vasilios. Entrepreneur. Chairman of the Athletic Club named «KORONIS of Kilada. 2.ANTIKAS Andrianos son of Aghelos. 3.ANTONIOU Emmanuel son of Stavros. 4.ANTONOPOULOS Antonios (Antony) son of Athanasios. PhD Engineer, Municipal Councilor of the Municipality of Kranidi 1999-2006. 5.ASIMAKOPOULOU – MATHIOUDAKI Chrisovalado daughter of George. 6.VATHIS Nikolaos son of Efstratios. 7.VLACHOYIANNI Maria (Mary) daughter of Andrea. 8.GHALATI – MANARIOTI Ekaterini (Catherine) daughter of Panayiotis. Graduate of Business Administration, Painter. 9.GHIONIS Ioannis (John) son of Adrianos. Lawyer, Member of the Bar of Nafplio. 10.DORBARIS Panayiotis son of George. 11.EVAGHELOU Eleni (Helen) daughter of George. Interior Architect, Graduate in Social Theology University of Athens. 12.ILIOU Evaghelia daughter of Nikolaos. 13.KAPOYIANNIS Konstantinos (Kontos) son of Panayioti. Civil Engineer, Civil infrastructure projects. 14.KARAISKOS Christos son of John. 15.KONDILIS Panayiotis (Captain) son of Sotirios. 16.KORDONI Irini (Irene) daughter of Konstantinos. 17.MIZIS Dimitrios (Jim) son of Panayiotis. Electricity Company (DEH) Clerk, Municipal Councilor of the Municipality of Kranidi period 2003-2010, Deputy Mayor of the Municipality of Kranidi period 2005-2006. 18.ΜONA – KOLIBADI Dimitra (Ami) daughter of Kiriakos. Packaging and marketing of traditional products, Graduate in Informatics (IT), President of the Municipal Community of Kranidi period 2011-2014. 19.BIAS Savvas son of Emmanuel. 20.BOURIKAS Yiorgos (George) son of John. Bailiff, Vice President of the Association of Bailiffs Courts of Appeal of Nauplio – Kalamata. 21.PARIANOS Petros (Peter) son of Ioannis. Surveyor –Engineer, Municipal Councilor of the Municipality of Kranidi period 1987-1990 and 1999-2002, Municipal Councilor of the Municipality of Ermionida period 2013-2014. 22.PATERAKI – BINIARI Vasiliki daughter of George. 23.SKLAVOUNOU Maria (Mary) daughter of Panayioti. 24.SOFIKITIS Pantelis son of Christos. Builder, Member of the Association of Builders of Ermionida. 25.SPAROU Garifallia daughter of Nikolaos. 26.SCHINA Ioanna (Jane or Yianna) daughter of Anarghiros. Doctor, Director in the National Health System (Nuclear Medicine). 27.TOUTOUNTZI – KABOURI Dimitra (Mimika) daughter of Dimitrios. Retired civil employee (IKA), Municipal Councilor of the Municipality of Ermionida period 2011-2014. 28.ΤSATSAROS Panayiotis son of Charalabos. 29.FASILIS Nikolaos (Nick) son of Ioannis. Private Employee, President of the Local Council of Kilada. 30.FOSTINIS Emmanuel, son of Michail. 1.KIRITSIS Antonios son of Dimitrios. 2.LABRAKI – ANTONIADOU Maria (Mary) wife of Konstantinos. 3.MESINEZI – PAPANDRIANOU Anna (Anne) daughter of Nicholaos. 4.MOSCHOVI – MOROGLOU Maria (Mary) daughter of Efstratios. 5.BAZOS Panayiotis son of Αnastasios. Municipal Councilor of the Municipality of kranidi period 2007-2010, Municipal Councilor of the Municipality of Ermionida period 2011-2014, Chairman of the Board of the Legal Entity of Public Law of the Athletic Center of Ermioni named « GEORGE AND EVANGHELIA BOURNAKI». 6.SKOURTIS Dimitrios son of Petros. Private employee, Accountant, member of the Board of Public Benefit Corporation Sport and Environment of the Municipality of Ermionida. 1.GHALIATSOU – ATHANASOULA Apostolia (Tolia) daughter of Triantafyllos. Graduate French teacher, Private Employee. 2.ΖERVAS Ioannis (John) son of Panayioti. Retired Employee Public Power Corporation (DEH). 3.ΚANELLAKOPOULOU – KOTSI Ekaterini (Catherine) –Fratzeska daughter of Georghios. 4.KULURIS Spiridon son of Dimitrios. 5.LEBESIS Panayiotis son of Sotirios. 6.ΜACHERAS Panayiotis son of Dimitrios. Employee of the Telephone Company of Greece. 1.GRIGORIADOU Urania daughter of Ilias. Writer, member of the Society of Greek Writers. 2.BELESIS Athanasios son of Alexios. 3.PAPASTERGHIU Ioannis (John) son of Evaghelos. 4.PIROUNI Marianthi daughter of Stefanos. 5.SOFIKITIS Konstantinos son of Panayiotis. 6.AMSTUTZ Brian son of John. 1.VOGKLIS Yiorgos (George) son of Stamatios. 2.THIVEOU – GHIUSU Paraskevi (Vivi) daughter of Ioanni. 3.SARANTOS Aghelos son of Konstantinos. Honorary Head of Elementary Education, Former School Counselor. 4.ΤSELOS Kiriakos son of Κonstantinos. 1.DRAPANIOTIS Anarghiros son of Evaghelos. 2.ΜOUYIOS Antonios (Antony) son of Petros. President of the Local Community of Heliokastro. 3.ΤZANI – KALLI Theodoti daughter of Anarghiros. 1.ΑTHANASAKOS Christos son of Ioannis. 2.PETRELLIS Efstratios son of Stilianos. 1.ΑGHOURAKI Despina daughter of Nikolaos. 2.STAPA – MASTROKOLIA Ekaterini daughter of Evaghelos. 4.FLORIS Yiorgos (George) or Marikakis, son of Ioanni. 1.ILIAS Nikolaos (Nick) son of Dimitrios. 2PAPAGHEORGHIU Paraskevi daughter of Vasilios. Upgrade of the function of the municipal and local communes. Better function of the participation statutory, contemplated in the Kalikrates project (consultation committee, community assemblies, local referendums). Implementation of a citizens’ telephone line. Acceleration of the procedures for the Municipality to acquire administrative sufficiency. Submission of a request to the Government to amend Law 3852/10 for the potential participation of our Municipality to developmental structures. Function of an administrative model of the Municipality based on the principle of collectiveness. Support of Diavgeia (Transparency) project with every possible means. Education – training of the Municipality staff and the executives of local government. Demand for covering the available posts of our Municipality with assistant- administrative personnel. Support of private investments in the area on condition that they are compatible with the general schedule of the Municipality and the maintenance of environmental rules and conditions. Promotion of local agricultural products. Connection with the tourist business on the creation of a list of recipes and local dishes. Προώθηση των τοπικών αγροτικών προϊόντων. Support of Co-operatives and of producers’ partnerships. Activation of cooperation with the resort co-operatives to solve their problems. Demand of realization of the regional plan on the central handling of litter. Until the realization of this solution, cooperation with the Ministry of Environment and Climate Change and any other relevant department to ensure daily transfer of litter to refuse dump. Improvement of the litter collection system and search of less expensive solutions. Improvement of the system of separation of litter at the source, so as to lessen the amount of litter to be transported, in cooperation with the Greek Company of utilizing litter. Transport to refuse dump both of the packaged and non-packaged refuse, lying at the package unit in Stavros, Didyma, and environmental restoration of the place. Full restoration of the old uncontrollable refuse dumps in the Municipality’s areas. Search for a cheaper solution in dealing with organic waste.. Organizing road and beach cleaning expeditions in cooperation with institutions and citizens’ unions. Update of the Municipality’s cleanness regulation and strict enforcement of this regulation. Campaign of information to the citizens and visitors and organizing events on sensitization and participation of citizens to a clean Municipality. Activation- information of the citizens and participation of the school community in the implementation of the recycling project. Demand for the project of the lock in Tzertzelia to be involved in the next planning period. Promotion of the solution of desalination for the provision of water supply in Kranidi, Ermioni and the other sea villages of the Municipality. Immediate implementation of the project of changing the water supply network of Kranidi. Search for financing possibilities of the Anavalos project, in cooperation with the regional authorities and the Ministry of Environment and Climatic Change. Promotionofthenecessaryresearchonthedistributionnetworks. Environmental Education in cooperation with school units and organizations on the correct use and distribution of water. Schedule of a rate policy aiming at the rationalistic use of the water adopted to the consumers income capacities (social rates to the vulnerable social groups eg. the unemployed, families with many children). Geological research on the estimation of water supplies. Implementation of the included project of the drainage in Kranidi, Porto heli and Kilada and the pretreatment of sewage. Improvement and expansion of the existing drainage network in Ermioni. Upgrading of the organic cleaning plants of Kranidi and Ermioni aiming to produce irrigation water. Improvememt of the conditions of rejection and compost making of the produced sewage mud. Financing and technical research on the creation of networks and plants of organic cleaning in small villages of the area. Completion of the revised town planning of Kranidi (sector B). Proclamation of traditional houses on sector A of Kranidi. Completion of town planning of the town of Ermioni. Completion of town planning of the area of Saladi. Modification of the General Town Planning of the town of Kranidi. At the same time, the Municipality will participate in all local and regional stages of Town planning through the Town planning committee. Recording and rating the environmental issues of the broader area of the Municipality. Estimation of possible environmental problems risks and suggestions on solving them.. Creation of a data base which will include research and measurements carried out by various institutions. The Municipality’s policy on environmental issues will be determined and specialized on the basis of this project and after open public consultation with the citizens. Strict lawkeeping on the protection of the coasts and our access to the beaches. Rural road construction. Despite the fact that the Municipality’s incomes become less and less, effort will be made to the improvement of their administration. We aim at the rural roads to be passable and if possible asphalt paved. Urban road network of villages.Our effort will concentrate on preservation and restoring work where necessary. Public Lighting. Effort will be made on rationalizing and cutting down the huge cost on energy for public lighting which exclusively burdens the citizens. Recreation of public places. Effort will be made for the public places to be kept neat and clean. Every possibility for the important recreations to get included in projects will exhausted. According to their annual action schedule, the local town communities will assess their needs and priorities. It is our commitment to carry out recreation works all over the area of the Municipality, based on the principles of the Democratic Scheduling. Improvement of the road network connecting Ermioni and Porto Heli. Creation of a Multitheme cultural centre at the building of the association in Kranidi and the creation of an olive oil and agricultural tools museum. Realisation of important touristic infrastructure of the touristic marine in Ermioni and tourist boat shelter in Porto Heli. Establishment and function of a body at the Municipality responsible for the strategic planning and maping of the touristic policy. Creation of a brand name of an agricultural product and its connection with the rest of the Peloponnese and the islands of the Argosaronic Gulf.. Connection of the touristic product with the traditional agricultural products of our area. Cooperation with the tourist industry businessmen on the improvement of the touristic product. Support to the efforts of the Touristic Organisation of the Peloponnese to convert the military airport to a civil one and improvement of the road connection of Tripolis and Ermionida. Improvement of our Municipality’s port facilities with immediate priority the restoration of the port facilities in Kosta. Demand for the construction of a country peripheral road of Porto Heli. Recreation of the beach front of PortoHeli. Research on the establishment of a hydroplane transport line. Realisation of a project by the Ministry of Environment and Climatic Change on the creation of a diving part of an archaeological type in the sunk town of Alieis. Support on actions and aims of the legal body of social solidarity, welfare, culture and education of our Municipality. Cooperation with the responsible Archeology Offices on the protection, making known and promotion of the archaeological sites of our Municipality. Support and strengthening of the actions of the public libraries in Kranidi and Ermioni..
Support and strengthening of the clubs and amateur groups which promote the culture of our area (Music Club of Ermioni, Ermionida Drama Society, and local cultural club.. Establishment of a cultural festival in Ermionida to promote the cultural creation. Strengthening of feasts which make our traditional local products known. Research on organizing a historical archive- museum of our Municipality at Dimotsi-Elinas’ building.. Creation of an archive by the Municipality of Ermioni aiming at promoting the area. Foundation of evening classes of the vocational senior secondary school. Installation of Interactive Boards in the school units funded by the National Strategic Framework Account. Updating of the equipment of the computer laboratories in our Municipality. Promotion of the request of the assignement of ex DEPOS for the construction, among others, a new school campus. Improvement of School Libraries in cooperation with the local libraries. Creation of parking areas at the school units, especially at Kranidi Junior –secondary school and at the secondary school of Ermioni. Cooperation with the Youth Foundation and Lifelong Learning on the continuation of the structure of ‘Second Chance Adults’ School in our Municipality and the strengthening of the Regional lifelong Learning Centre. Support of the ‘Help at home’ project. Support of the voluntary social solidarity and welfare teams who are active in our municipality. Foundation of a modern social service in our municipality in the Kalikretes project N 3854/2010. Inclusion of consultation projects in cooperation with the Organisation of Employment of Working Staff. Andsocialpartners. Realisation of projects on fulfilling projects fighting unemployment, in cooperation with the Organisation of Employment of Working Staff. Maintainance of sports facilities – infrastructures in all the site of our municipality. Creation of a sports room in every local newspaper. Demand for the immediate fulfilling of the works of the Ministry of culture and sports concerning the reconstruction of the football pitch of Kranidi and the green covering at Iliokastro. 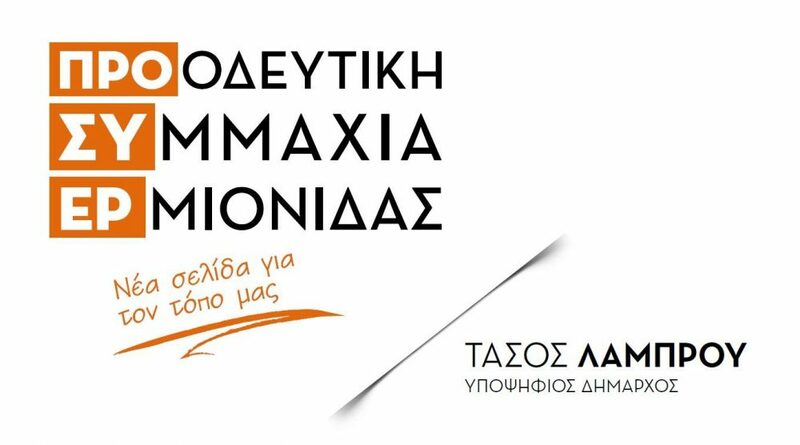 Immediate start of work on the construction of a closed basketball Άcourt in Kranidi according to the donation of Mr Konstantinos Dimotsis the Greek. Research on the contstruction of a swimming pool on the municipality of Ermionida. Support on actions and sports club active in our municipality. Foundation of sports events of local and national sise in cooperation with the cooperation of tourist partners and athletics.